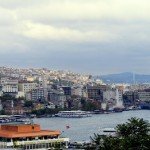 Istanbul and food and Istanbul and food and… Yeah, as well as the ridiculous array of sightseeing to be done in Istanbul, food is also what makes visits to the city so memorable for us. It’s not that we can’t get some of these foods in Fethiye, it’s just, well, the setting and the history and the atmosphere. Whenever we’re in Istanbul, we always try to make a visit to the Beyazıt area to visit our friend, Necmi, at his shop, Istanbul Ceramic. But, we also have a wander around Süleymaniye Camii and surroundings, too, just to see progress on the seemingly never ending restorations going on there. Progress might be slow but it’s not half going to be worth the effort once all is completed. Our last little exploration revealed the Golden Horn and Bosphorus views from the gardens, over the rooftops. We didn’t go inside the mosque, this time; just wanted to take in the scenery…and eat. Because, as well as this stupendous masterpiece of a mosque by Mimar Sinan, the Süleymaniye area of Beyazıt is also famous for kuru fasulye. This is Prof. Sıddık Sami Onar Caddesi – or ‘that kuru fasulye street,’ as we like to call it. Once you’ve marvelled at the mosque and wandered the grounds and photographed the incredible views and decided Istanbul is just mesmerising and too much to take in, it’s time to go off and fill your rumbling tummy. And when it comes to kuru fasulye, Süleymaniye is exactly the place you want to be. Erzincanlı Ali Baba Kuru Fasulyeci, to the right. The mosque is on the left. 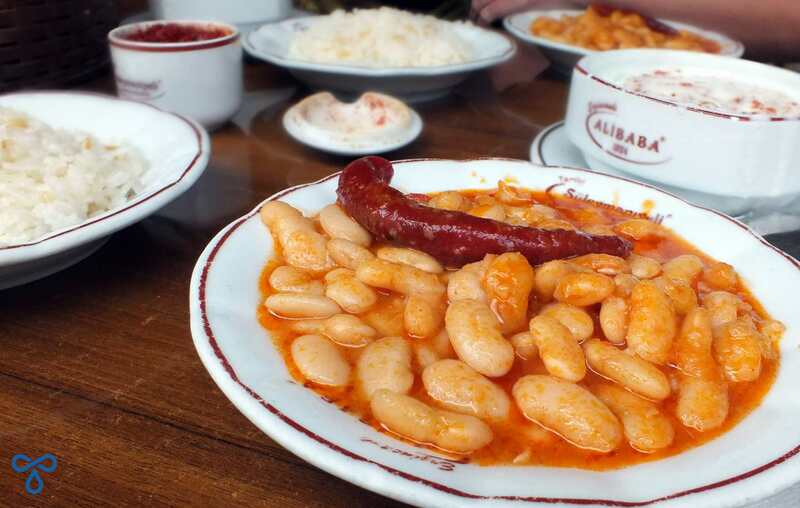 Erzincanlı Ali Baba Kuru Fasulyeci is famous for serving up bowls of plump white beans in a lightly-spiced tomato sauce. Pure Turkish comfort food, and, despite being right next door to a major Istanbul tourist draw, it’s not going to cost you the earth. No, this is proper cheap, wholesome grub that’s gonna set you up for the rest of the day. There just to entice the tourists? No, absolutely not. Of the tourists that do make it to Süleymaniye, a few will sit down to eat here, but Erzincanlı Ali Baba Kuru Fasulyeci has been around since the 1920s. At lunchtime, the place is packed with office workers, local tradespeople and students from the various faculties of Istanbul University. Many of those faculties are snuggled around this area. Compared to beautifully hectic Eminönü, for example, this area is peaceful and pedestrian. It all feels very quaint…but away from that peaceful cobbled street of Süleymaniye, kuru fasulye at Erzincanlı Ali Baba Kuru Fasülyeci is a conveyor-belt-type operation. Numerous waiters cutting huge chunks of fresh Turkish bread, bowl after bowl of kuru fasulye appears in the hatches and yet more waiters grab them and carry them over to hungry customers packed onto the rows of tables. There’s nothing posh or serene about this eating experience. You sit where there’s a space, the basket of bread and a bottle of water appears before you and the waiter looks at you. Obviously, you’re here for kuru fasulye so now all that’s left is for the waiter to offer you accompaniments. Rice? Yeah, go on then. 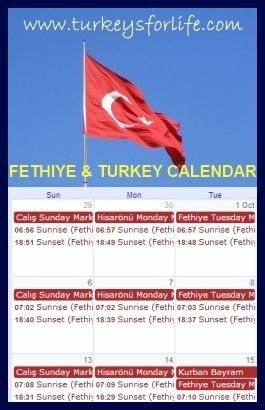 Cacık? Yeah, go on then. Within a matter of seconds, the food appears. Just mm-mm-mmm. Look at that big fiery chilli on top, too. At this point, we notice some of the people devouring their famous Süleymaniye kuru fasulye are also complimenting the dish with turşu. Ohh, we weren’t given the turşu option. We glance around for a waiter – you’ve gotta be bold and call out, here, otherwise your chances of attention are slim. A huge bowl of pickled chillies and gherkins is plonked onto the table and we’re happy. This Turkish staple of beans and rice is so tasty and so filling and Erzincanlı Ali Baba Kuru Fasulyeci portions are far from small. Eventually, we can eat no more. There’s still some rice in our bowls and thick wedges of bread sit in our basket…but not for long. A workman leans over towards us. Erzincanlı Ali Baba Kuru Fasulyeci is in the Süleymaniye neighbourhood of Beyazıt on Professor Sıddık Sami Onar Caddesi. The street is easy to find, running along the boundary wall of the mosque. Erzincanlı Ali Baba kuru fasulye is meat free. For 2 of us, 2 portions of kuru fasulye, 2 portions of rice, 2 bowls of cacık and 1 bowl of turşu was between 25-30 TL (2015). We love to make our own kuru fasulye at home, too, and, especially in winter, we like to add meat, as do many Turkish people. For the meaty version, here’s our etli kuru fasulye recipe. As well as kuru fasulye, we love to write about all the different foods of Turkey. We have a full article about the many different types of Turkish food which was put together after we’d asked all of our Facebook followers which their favourite dishes are. If you’re like us and want to recreate Turkish dishes at home, try some of these recipes from our index. Kuru fasulye is a famous dish in Turkey and it seems so simple and perhaps a bit boring but they are so yummy! 🙂 The kuru fasulye in Süleymaniye are extra tasty as they’re so plump. Of all foods, I missed kuru fasulye the most when I moved to the UK. Weird isn’t it, BaktoBodrum, how such a simple dish of beans and rice can be so loved and so tasty. 🙂 A perfect lunch.